Experience being immersed in a real commercial flight. Sit in the pilot’s seat and fly the world without ever leaving the ground. When you’re done, you feel like you’ve flown a real commercial jet with a full crew onboard. 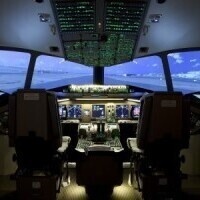 The most amazing and real flight simulator you will experience! A pilot will be with you to provide pre-flight briefing and hands-on guidance in the simulator. Visit www.uflysimulator.com for flight dates and time. An amazing chance! How can anyone miss this chance of experience being immersed in a real commercial flight. What an opportunity! Many have travelled through Flight not this kind by seating aside with pilot. People will sure rush to you company to avail this chance to fly like real commercial jet with a full crew on-board. I will sure pass this information with everyone I know.